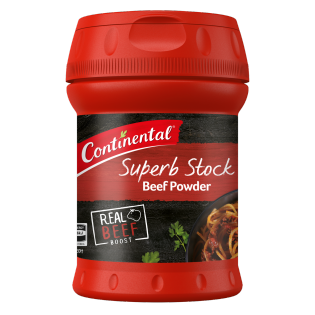 Whether it’s stirred, spooned or sprinkled, Continental’s Chicken Beef Powder is a wonderful addition to any meal, and is so versatile. Now with a handy sprinkle lid, you can scoop or shake straight from the tub, making our Stock Powder great to sprinkle onto veggies right before roasting, or add to your breadcrumb mixture to give your schnitzel a flavourful twist. Our Beef Stock Powder is made with real beef to add real rich flavour to your dish. And with no artificial flavours or added MSG, you can be sure you are cooking with a high quality stock. 1 teaspoon added to 250mL of hot water makes 1 cup of stock. For a stronger beef flavour, add stock powder to soups, casseroles, curries and gravy by either shaking or spooning the desired amount.